This vellum snowman features the Stampin' Up! set Snow Much Fun, a set that truly is SNOW much fun! 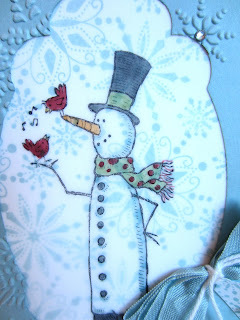 I find myself reaching for it time after time, and still can't get enough of the two happy snowmen wearing their winter boots, accompanied by the cheery winter birds. These characters never fail to make me smile. 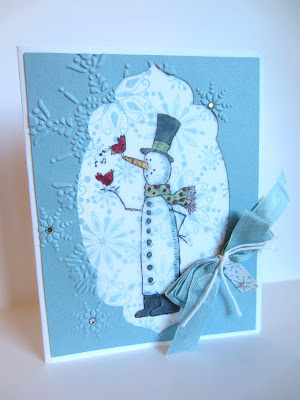 The tutorial to make this card can be purchased in a PDF format through my Etsy store, here: http://www.etsy.com/shop/paperseedlings The techniques used to create the card are fairly simple and result in a nice icy effect. I've never tried vellum. I love the snowman too. Vellum is so much fun -- and so elegant to play with. You should really give it a try, Christina! Oh he's adorable! The blues make me shiver!! Great job! I hope you're warmed up by now. :>) Thanks for the nice compliment! I love the card so cute! this is such a cute snowman!